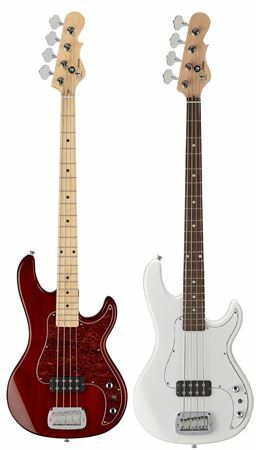 Order your G&L Tribute Kiloton Electric Bass Guitar from AMS and enjoy 0% Interest Payment Plans, Free Shipping, Free Extended Warranty & 45 Day Money Back Guarantee. Experience the impact of the G&L Tribute Series Kiloton. The verdict became clear so fast it would have put that wry grin on Leo’s face: the Made-in-Fullerton Kiloton is a smash-hit. Demand from players and misicians alike for a Tribute Series version thundered with the same visceral punch as the bass itself delivers. Just like its Made-in-Fullerton brother, the Tribute Series Kiloton features the most comfortable bass body ever created by Leo Fender. It’s compact and pure, with every curve and contour perfectly executed. The Tribute Series Kiloton delivers maximum firepower from its single G&L Magnetic Field Design humbucker, planted right in the sweet spot specified by Leo Fender back when the G&L factory was still called CLF Research. The Tribute Series Kiloton’s single Made-in-Fullerton MFD ‘bucker fires without the aid of a preamp, while a 3-position series/split/parallel toggle harnesses the coils’ power. Simple volume and tone controls are devastatingly effective, revealing a wide range of textures Leo’s MFD bucker is famous for. What’s more, the Tribute Series Kiloton is armed with a Leo Fender-designed Saddle-Lock bridge to transfer all the energy right into the body end-grain for an incredibly resonant instrument.